The ultimate classic doll, our Big Rag Dolly is hand knitted in the finest lambswool and dressed in gorgeous hand crafted vintage fabric clothes. The hand knitted hat and scarf, hand stitched felt shoes, knickers and dress can all be removed, allowing the child to dress and undress their dollies. 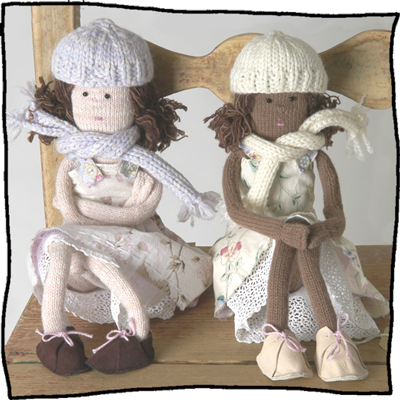 The dolls are knitted in pink or brown wool, with a choice of hair and dress colour. No two dolls are ever the same. Dresses can also be matched to a particular outfit of your choice. Please contact Laura directly with details or see below to attach a photo of the dress you would like her to copy. Each doll comes beautifully packaged in a box. Dimensions: Each doll is approx. 40cm tall. Select a picture file from your computer to include with this purchase.